Mac, my friend-for-life before he did me this kindness, called to say he’d secured four rear-of-stage lower-level tix for Night One. (The second show wasn’t put on sale until 15 minutes after the first, and though it wasn’t announced in advance, its existence was an open secret.) Off I went to the optometrist, where I spent about 400 pre-tax ducats for new glasses and contact lenses. Upon my return home, I promptly spent nearly as much — $345, on the (ahem) secondary market, sadly — for a pair of General Admission floor tix for Night Two. Call me a sucker, call me an enabler. They still cost less than the pairs for the Friday-night show in Philadelphia on Oct. 5 that I’d been eyeing, and I’ll probably hear a greater variety of tunes on back-to-back nights in the same city than I would attending the first night in Philly and then the first in DC five weeks later. Verily, my powers of rationalizaton are mighty! I’d wanted to believe I was too mature, too fiscally responsible, too smart to do this sort of thing anymore. The truth hurts. But the truth rocks, too. Besides, I published something pretty much every day this week. So it’s not like I haven’t been earning my indulgences. See Ah, Wilderness! at ACT; KT Tunstall’s new album, Drastic Fantastic; Nick Lowe at the Birchmere; Suzanne Vega, too. 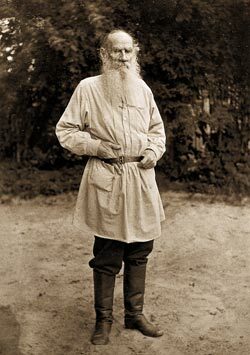 Plus a little — very little — something about the exhibit of Sophia Tolstoy’s photos at the American University Museum. Next week: PJ Harvey and — I hope — Rilo Kiley. But Do They Smoke Marijuana in Greensburg? I’ll admit I was pretty pleased with this. I got to take my old man to the Willie, Merle & Ray Price (first-name notoriety eldudes him, I guess) show; got to rub elbows there with the Man Called Freedom; and I thought the review came out really well. (The Man Called Freedom agreed.) Plus, it got decent play when it ran in last Saturday’s Paper of Record. “Mama Tried” was a predictable triumph, but even better was a brilliantly timed walk-on by Nelson during “Okie From Muskogee” — Haggard’s immortal reflection of his dad’s anti-hippie stance, and rather at odds with Nelson’s own biodiesel-powered, IRS-taunting lifestyle. cruising through Muskogee, Oklahoma in 1969 when Eddie Burris, drummer for Haggard’s band the Strangers, remarked offhandedly, “I bet they don’t smoke marijuana in Muskogee.” Overhearing Burris’s remark, Haggard turned it into a song he viewed as no more than a tongue-in-cheek novelty (both men share composer credit). “Okie” nonetheless became a huge country hit, viewed by 1969’s equivalent of red-state America as a repudiation of the whole hippie counterculture though longtime, long-haired Haggard fans Jerry Garcia and Gram Parsons, seeing it as Haggard did, shrugged it off. Today, it’s a period piece. Concert reviewers needn’t have encyclopedic knowledge of the acts they evaluate, but it helps to have done some homework first. Klimek, unfortunately, did not. Not much ambiguity there, huh? He doesn’t say, “The way I always heard the story is . . .” He doesn’t phrase his objection in a way that allows for the possibility that there could be more than one version of the story. He just goes straight for the jugular, stating matter-of-factly that I didn’t do my homework. Most people did not realize (and some still don’t) that “Okie From Muskogee” was a social commentary that did not necessarily reflect Haggard’s personal worldview. “Ya know, I’m like an actor, and whatever role you see an actor in shouldn’t have anything to do with his own personality, but it does, of course,” he says. “That song typecasted me for a long time. Bada-bing! Well, not entirely. 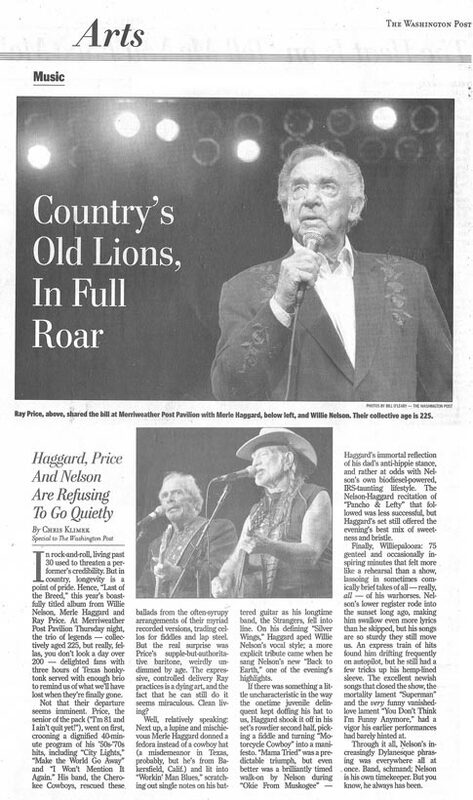 It turns out Hag himself has told a lot of differerent stories about how and why he wrote “Okie from Muskogee” over the years, as mentioned in this 2004 L.A. Times profile by the great Bob Hilburn. After my editor replied to the letter-writer (“It turns out Chris was correct”), the guy responded with a lot of bluster about how he knows Bob Hilburn, and how he’s interviewed many legends of country music in his three-decades-plus of writing on the topic, and actually says he’s glad he never got to interview Hag because the conflicting accounts of why he wrote probably his most famous song would drive the letter-writer crazy. But he never apologized for having accused me of not doing my research. Maybe after 33 years, he’ll have learned that a false accusation warrants an apology. You think? Accident tells you everything you never wanted to know about Betty rocker Amy Ziff. Theatre J’s new “Incubator Series” is meant as a proving ground for developing works. So it’s possible that Accident, the show they’ve chosen to kick off the series, could get better. As it stands, the show just leaves you with the impression that you needn’t even be all that famous to have a vanity project. Read all about it at DCist. Morning, all. My review of the reconvened Meat Puppets’ set at the Black Cat Sunday night is in today’s Paper of Record. Took my old man for a free consultation with the venerable firm of Nelson, Haggard, & Price Thursday night, courtesy of the Paper of Record. My review is here. Willie didn’t play “Cowboys Are Frequently Secretly Fond (Of Each Other),” but otherwise I couldn’t really have asked for more. Hag’s set was better, though. MYSTERIOUS WAYS: Kaufman’s latest is a musical detective story. 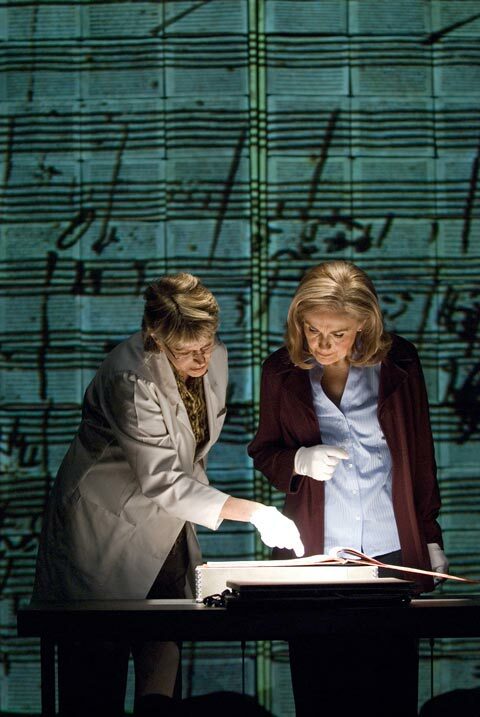 Saw Moises Kaufman’s new 33 Variations at Arena the other night; dug it mightily. Read all about it on DCist. 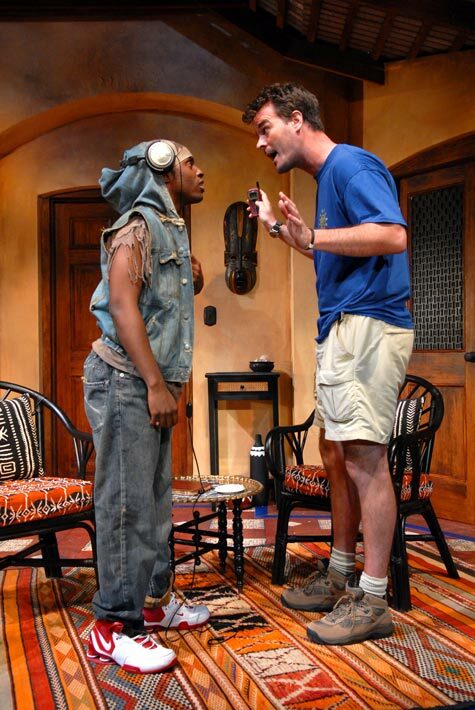 Kofi Owusu and Tim Getman raise their voices to one another in The Unmentionables. 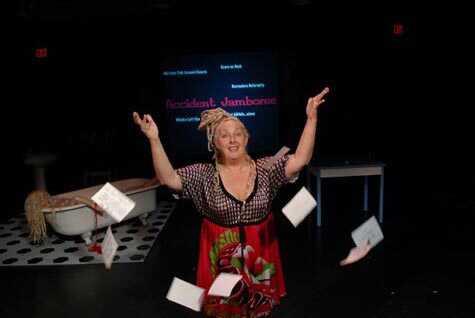 My DCist review of Woolly‘s terrific season-opener, The Unmentionables, is up today.